July 21st: Another good day. The front had passed and the winds were much lighter, making for trickier sailing. Three more races were completed before time ran out. That added up to 7, which allowed for one drop. Results: There was no doubt who the winner was. Jim Goddard had managed to come up with 6 firsts. He was followed by “Boots” Boutilier, also from Halifax, with 13 points. 3rd place went to Paul Switzer with 14. 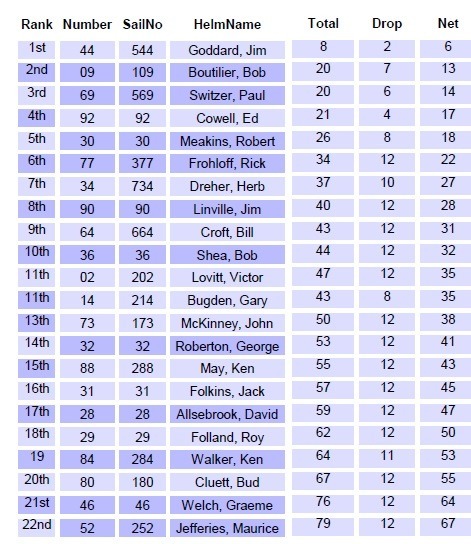 Next HYC”s Ed Cowell scoring 17 and Robert Meakins with 18 to round out the top five. Awards were presented consisting of Sail Canada (CYA) medals, HYC Soling 1m Plaques and club flags.